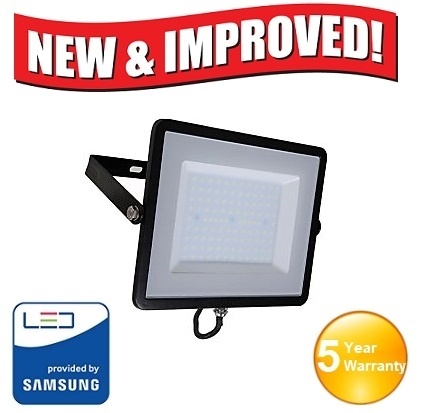 This SMD LED floodlight is incredibly energy efficient and powerful. SMD LED technology provided by Samsung, offers higher lumen output and lower energy consumption than even older LED lights. It uses fewer and larger LEDs to produce a greater output. This makes it perfect for almost any industrial, commercial or other environment where a low energy but high performance floodlight is needed. Completely maintenance free. Get on with what you need to without having to worry about your light. Cost effective due to its energy efficiency. This is especially true when replacing energy hungry halogen lights. Ideal for commercial and certain domestic applications where a high power fitting is required. Pre-wired with 1 metre of black rubber flex. Wide beam angle of 110 degrees. This exceeds the vast majority of other lights. Long lifespan of 30,000 hours on average. Take advantage of the best in LED technology with the 100w LED floodlight. If you have any questions, please contact the customer service team on 02476 706106.